Throw away that bag of frozen french fries! 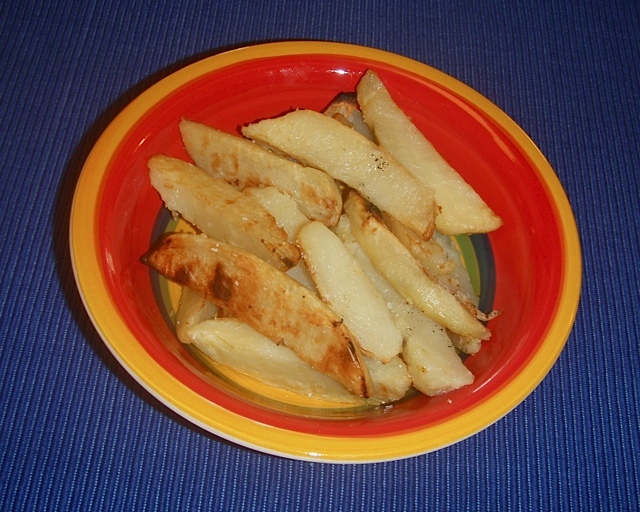 These tender potato wedges are a perfect side to any of your grilled meats. Easy to make and very pleasing to your palate; your family will thoroughly enjoy this simple recipe! Peel and cut each potato into eight wedges. Boil potatoes just until you can easily pierce them with a fork. Drain and place them in a bowl. Sprinkle with olive oil and place on a hot grill. Turn them over once or twice and grill until they start to become a golden brown (giving the skin a slightly crisper texture). Remove and sprinkle with salt. Add a little malt vinegar for taste if desired. Enjoy!! If you'd like a printer-friendly version of this recipe, Click Here.